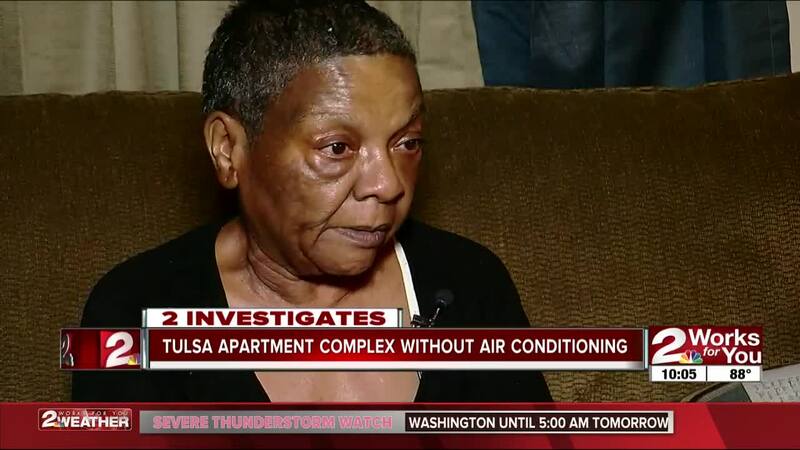 TULSA -- Magnolia Manor Apartments making headlines once again after tenants claim the HVAC system is broken, leaving them without air conditioning. Tenants say property owners have given a few of them window air conditioning units, but only for one room. 2 Works for You lead investigator Katie Wisely first broke the story in January when the city condemned 36 apartments at Fulton Plaza, an apartment complex across the street, under the same management. Now, the city is keeping a watchful eye. The City has received a call about the apparent issue and says it's absolutely crucial that residents file a complaint using the 311 website. At that point, the City then can take action. The fan is on full blast inside Christopher Shrader's apartment. “I came in and both of my children were soaked and they were vomiting and they had a major headache because they were so dehydrated," he said. The only relief is from a window air conditioning unit, after Shrader claims the HVAC system broke. “I finally got fed up with it," he said. Shrader wrote a letter and gave it to management. He says he referred to his lease where he says it states that property owners are to provide and maintain the HVAC equipment. Shrader's neighbor says she faces the same problem. The City says it is keeping a watchful eye. 2 Works for You went to the Apartment complex office with Shrader. As soon as investigative reporter Wisely and Shrader walked up, someone inside the office locked the door. This isn't the first time the office has shut out our cameras. Wisely has tried to speak to management on three separate occasions. “What I would like to see is for those landlords and property managers to stop and think, ‘Is this a place I would move my family to? Is this a place where I would raise my children?’” Councilor Gilbert said. The City is ready to send code enforcement as long as tenants step up to the plate and Shrader is ready to take that risk. “Shut these things down," Shrader said.